Prestashop URL Redirects module enables you to implement 301, 302, 303 redirection. Remove 404 errors by redirecting your discontinued products or any other dead URLs to related products & store pages. 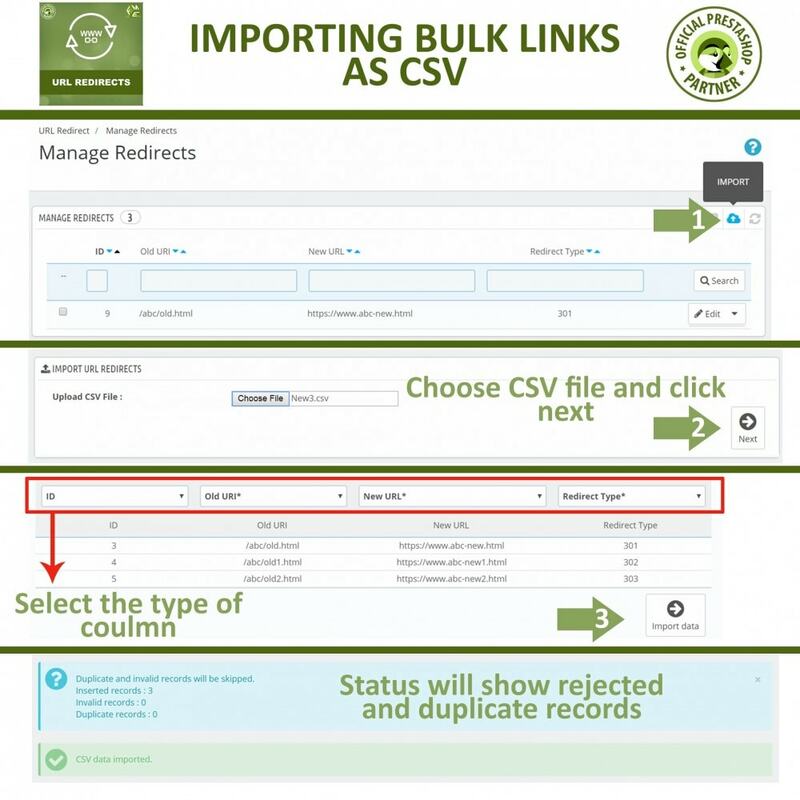 Import CSV to apply bulk redirects. What this PrestaShop redirect module does for you? Redirect discontinued product visitors to related products and generate more sales. 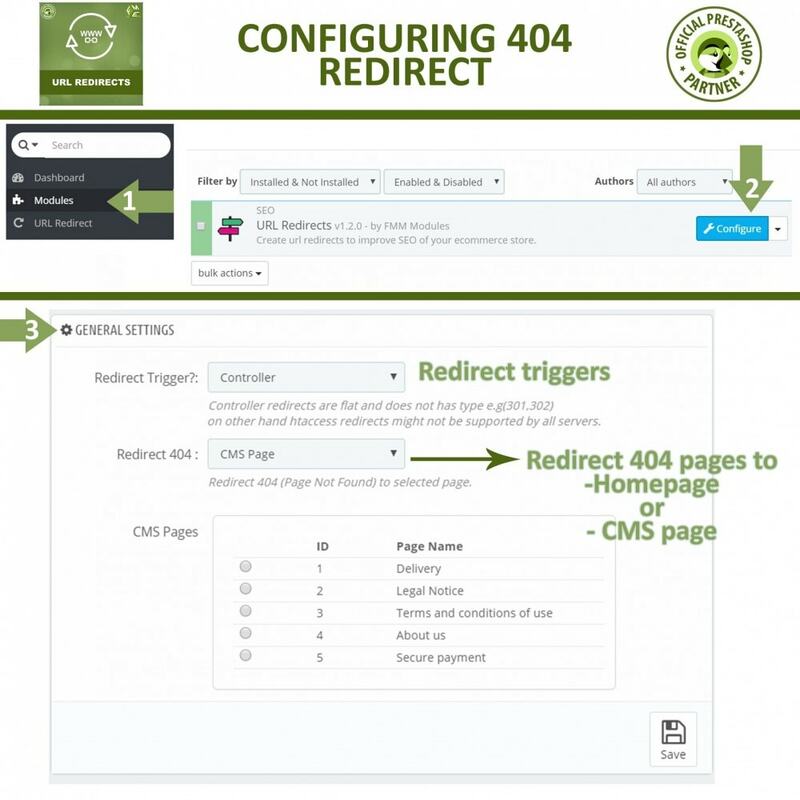 The PrestaShop 301 redirect plugin empowers you to manage the redirection of your business website. Whether you are moving a store to an advance version of PrestaShop or switching to another domain, this module offers a hassle-free creation of redirections from old URLs to new URLs. This redirection PrestaShop module also enables you to create bulk redirections by importing a file in CSV format. 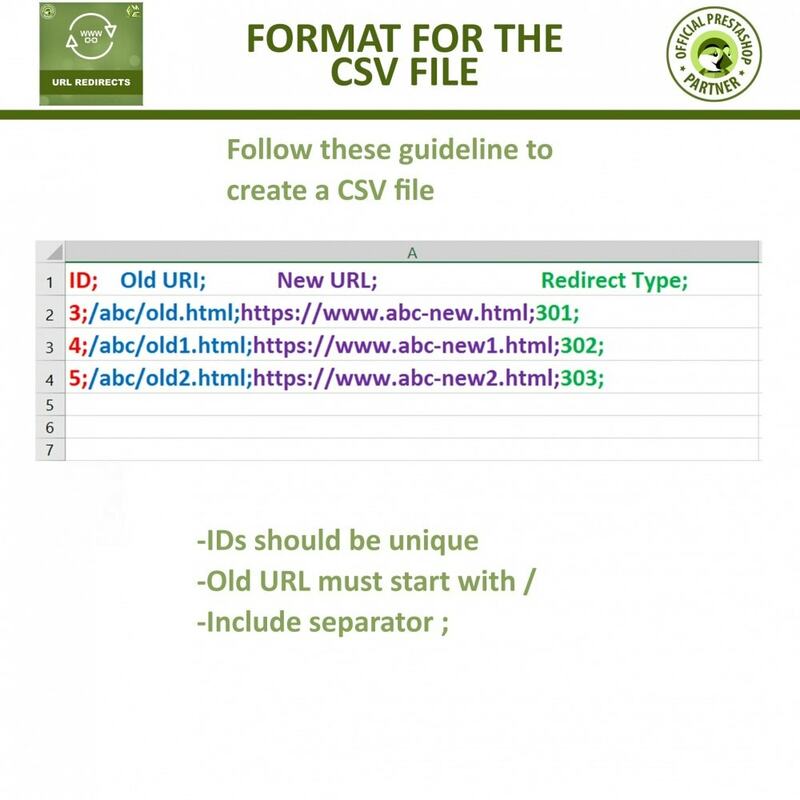 To retain the redirections as a backup, you can export a CSV file as well. With editing or deleting features, you can make changes or simply remove them from your website. The core theme of this PrestaShop redirect 301 is to retain the SEO rankings and customers of your store regardless of making changes to the URLs. A store having a page error is likely to be ignored by customers, which can be rectified by sending them to the right page, which can either be a home page, product page or category, or any CMS page. The URL Redirects module is equipped will the tool to send customers and search robots to an alternate page. Following are the some of the advantages you can avail after installing this plugin. The URL redirections give you the freedom to change any URL without fearing for the traffic loss because you can send people and search engine from the previously assigned URLs to the newer ones. To gain maximum exposure in search engine, business often uses multiple domains. You can forward traffic from different URLs to a central business website with the help of this extension. You can move the entire website to a new domain or eCommerce platform without losing online traffic by taking them to the newly created URLs. The URLs redirection saves your time in SEO activities, as it passes the link power of the old URLs to the modified and newly created ones. Customers often remember or bookmark URLs of their favorite store, so that they don’t have to search it again and again. If you make changes to a URL move to a completely different domain, you may lose the majority of your loyal customers. 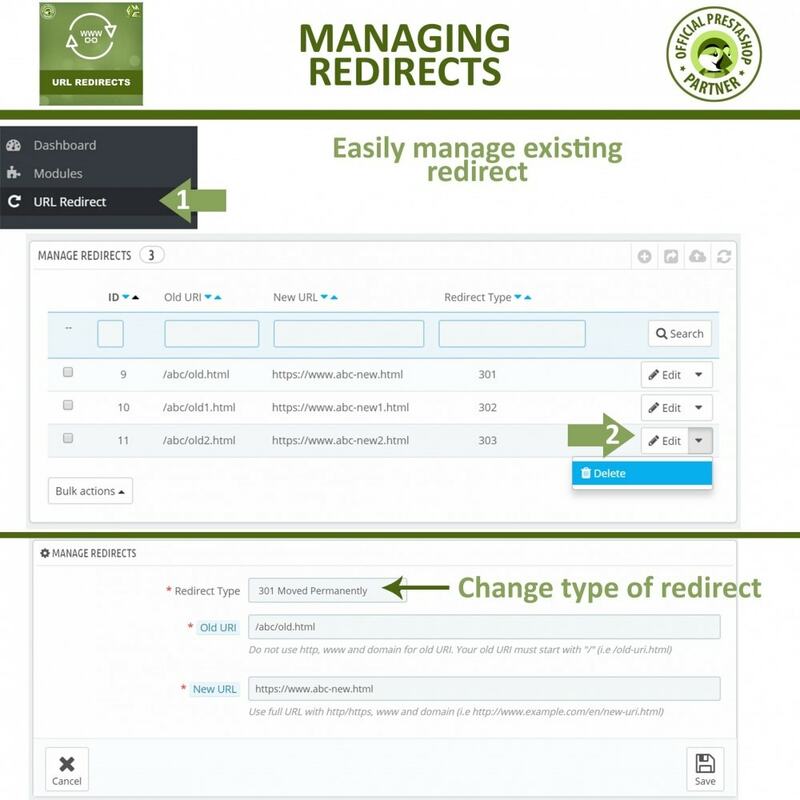 To have them at your store, you can set redirection from the old URLs with the help of this module. The benefits are described in detail below. The customers, who are visiting with the old URLs, will still be able to find their favorite products, categories, and pages of the store. You can eliminate 404 errors and send customers to the most relevant page, product or category so that they can continue shopping without errors. With URL redirection, your old and new customers can find you in search engine result pages as it pass the link power of the old URLs to the new ones. This module helps rank your website higher, which facilitates customers in finding you on the top of search results.